Add your class details to our directory. This kick is one of the most powerful martial arts leg techniques. It's effectiveness can be further increased by combining it with a suitable stepping move to utilise the body momentum and to cover the distance to the target. It can also be delivered from the rear leg (e.g. in front stance) in the case of a 'side kick to the front'. 1. Lift the thigh to the side of the body. 2. The edge of the heel of the foot (striking weapon) is then thrust out by extending the leg. 3. During impact the hips are used to transfer the body weight into the target. The supporting foot is rotated out to achieve this. 4. Bring the leg back to the original position to act as a groin guard. a) Recoiling the leg to the rear (as in the round kick). b) Striking with the flat of the foot (as in the freestyle variant). c) Over rotating of the supporting foot (ending up in a 'back-kick' style position). d) Scooping the leg out rather than utilising a correct lift. e) Lifting up high onto the ball of the supporting foot in an effort to gain height. This affects the stability of the technique. It is also advisable to practice positioning the hands into a suitable guard position. Power is sacrificed for versatility in this case and target can be made at a much greater range of distances. The foot follows a path perpedicular to the body (line of the leg parallel to the floor) and so is harder to block. a) Contact is with the flat of the foot but the ball of foot can even be used to gain a litle extra reach. b) No hip rotation is needed (except perhaps to aid with kicking higher). 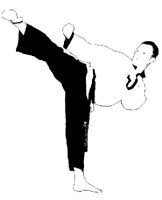 c) The kick can be adapted to an effective "push" and can actually be quite powerful, especially when a step is used. d) The kick is almost always delivered from the forward leg. Right Path London Personal Training | Goya-ra-ru Martial Arts, Birmingham.